Tuesday night I made my Twangy Meatloaf for dinner. It is one of the family’s favorite meals, and it’s not all that expensive to prepare. I make my meatloaf a little different than most people do, as you can tell in the picture. I cook my meatloaf in muffin tins. This helps with portion control and it also cooks faster than a whole loaf does. I always make more meatloaf than we need for one meal, because we all love the leftovers. I call it twangy because the worcestershire sauce mixed with the ketchup has a twang to it. I could have made half of this recipe and had enough for one meal for our family of 7. 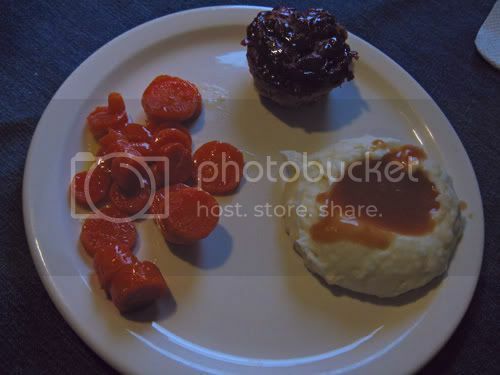 I also made the family favorite sides mashed potatoes, and honey glazed carrots. Combine turkey, oatmeal, onion flakes, and eggs in a bowl. In a separate bowl combine ketchup and worcestershire sauce. Add half of the ketchup mixture to the meat mixture, and combine. Spray muffing tins with non-stick spray of your choice. Fill each cup leaving a little room at the top, with my tins i got 18 meatloaf muffins. Put 1 Tablespoon of ketchup on each meatloaf and spread over the top. Bake at 375. I cooked mine for about 15 minutes, but cooking times will vary based on the size of your tins. If you wanted to be really creative you could put the meat in a mini-muffin tin and make bite size meatloaf, which little ones might really like. You will have between 1/2 cup and 3/4 cup of the ketchup mixture left. I use this mixed with 2 cups of water when I make my gravy. After your potatoes are peeled and diced, place them in a pot, add 1/2 tablespoon of salt, and cover with water. Boil until fork tender. While they are cooking dice your cream cheese and slice your butter; placing them in the bottom of your bowl. After potatoes are cooked, drain and place in bowl on cream cheese and butter. Add half and half, salt & pepper. I always start out with a little salt & pepper, tasting as I mix ; adding more as needed. Beat with a hand mixer until potatoes are creamed. Steam carrots, and drain. While carrots are draining melt butter in bottom of pan. Add carrots to butter, stirring lightly to coat. Add honey and heat until warm. This is a very quick and easy side dish. 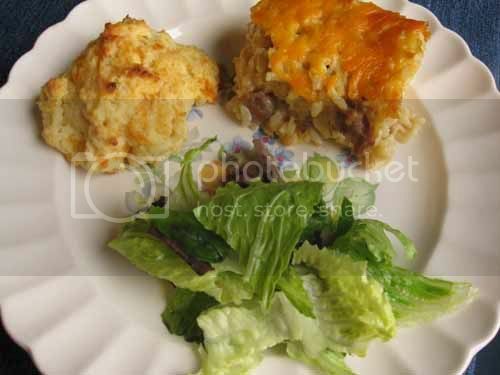 This is one of our family favorite casseroles, but for some unknown reason I don’t make it that often. I’m trying to look at cooking as frugally as possible, and this is a dish that falls into that category. Tonight I’m serving this with garlic cheddar biscuits, and a salad. The use of chicken noodle soup may seem rather unconventional, but it’s mighty tasty. I hope you will try it with your family, and if you do, I’d love to hear what they thought of it. Brown sausage in skillet. Mix rice, soups, & 1 cup of cheese together. When sausage is cooked, combine with rice/soup mixture, and spread in 9 x 13 baking dish. Heat at 325 until cheese melts and contents are bubbly. Combine flour, baking soda, baking powder, salt, & 2 teaspoons of garlic powder. Cut in margarine then add cheese and buttermilk, and stir in until moistened. Drop by heaping tablespoons about 1 in apart on a greased cookie sheet and bake at 450 degrees for 10 minutes. Melt butter and mix in remaining teaspoon of garlic powder. After removing biscuits from oven, brush butter mixture over biscuits. You can bake biscuits for 3 or 4 additional minutes, or you can serve. Makes about 1 dozen biscuits.